By Eileen and Paul Goldfinger, Editors @Blogfinger. Good news for tomato lovers: the local farmers are producing wonderful, juicy, tasty Jerseys now. We tried them at Wegmans and at the Saturday Farmers Market (Sunset Ave.) in Asbury Park. Wegmans is charging $3.00 a pound while the AP Market current price is $2.50. When selecting Jerseys, look at the top. If the red goes to the stem, they are ready to eat. Otherwise, if it is greenish there, you can let them ripen at home for a day or two. We learned that from Laurie at her Neptune Market which is now closed. She is missed by many. She used to sell corn by a 90 year old farmer named Donald who was still active, but he died a few months ago. 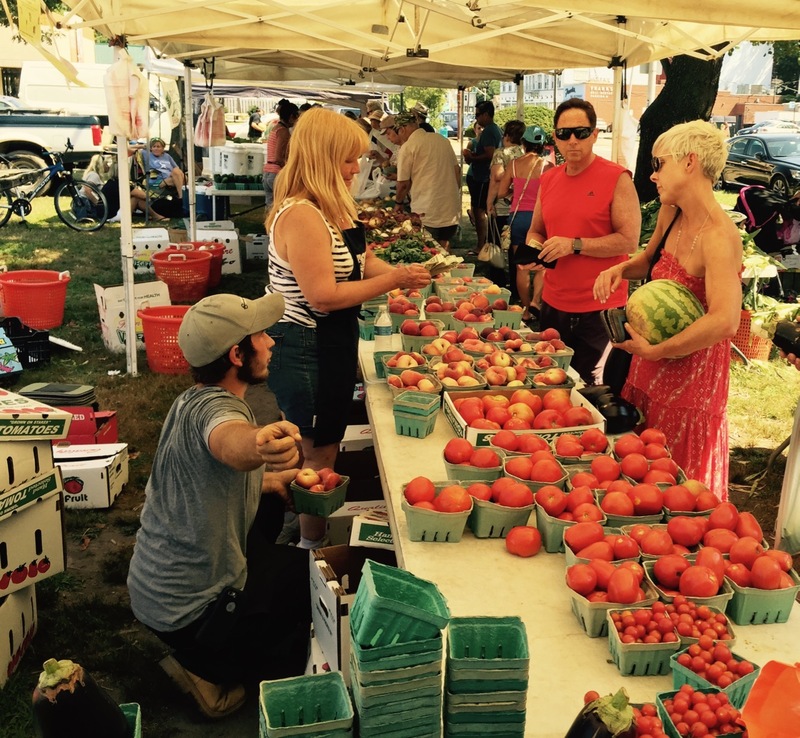 Will the tradition of Jersey farmers markets continue?—-Yes, but their prices have gone up. 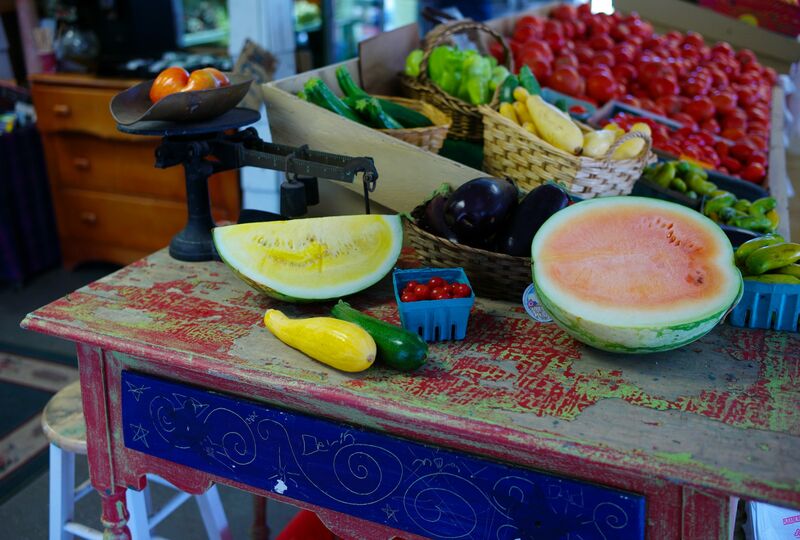 If you discover any great farm stands, let us know. Here’s a report from Laurie’s Market two years ago—photos and information. This time last year, the Jerseys were sad. 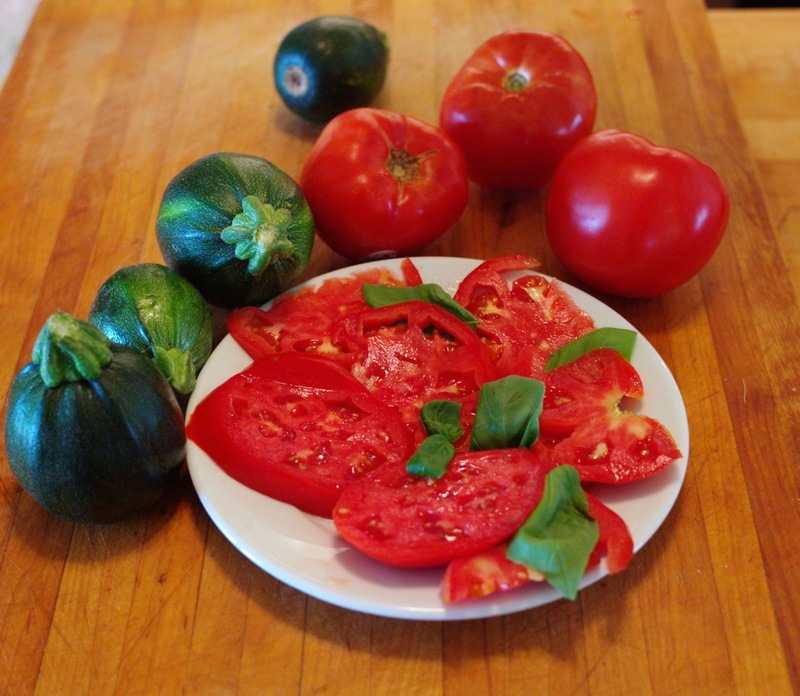 RECIPE: Eileen Goldfinger recommends a Caprese salad if you have good tomatoes. 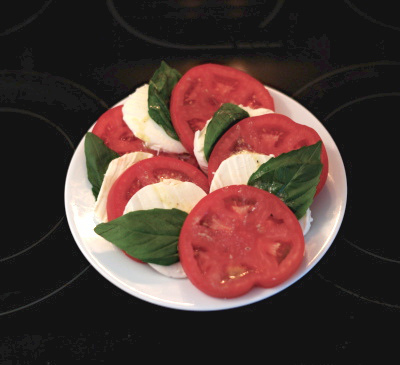 Cut some thick slices of tomato and matching slices of fresh mozzarella cheese. Then layer the slices in an alternating pattern with a leaf of basil on each slice of cheese. Then prepare a vinaigrette by mixing 1/4 cup extra virgin olive oil, juice of 1/2 lemon, pinch of salt, some freshly ground pepper to taste, and 1/2 tsp of Dijon mustard. Whisk the mixture until the ingredients are blended and then drizzle on top of the salad. Jersey Tomatoes (JT’s): 2013 edition. Featured at Laurie’s Farm Market in Neptune. All photos by Paul Goldfinger at Laurie’s Market. 511 Atkins Avenue, Neptune Twp., NJ. © August, 2013. Click left to enlarge all photos. A few days ago we were in Wegmans and discovered that there were no Jersey tomatoes. They had some beefsteaks from Canada, and the sign said that they were coated with wax to “preserve freshness.” They might have added that the coatings also make the fruits look more perfect to attract buyers. The produce guy said that the weather had made the Jersey crop unavailable at this time. We bought no tomatoes that day at Wegmans—not in mid-August in Jersey. 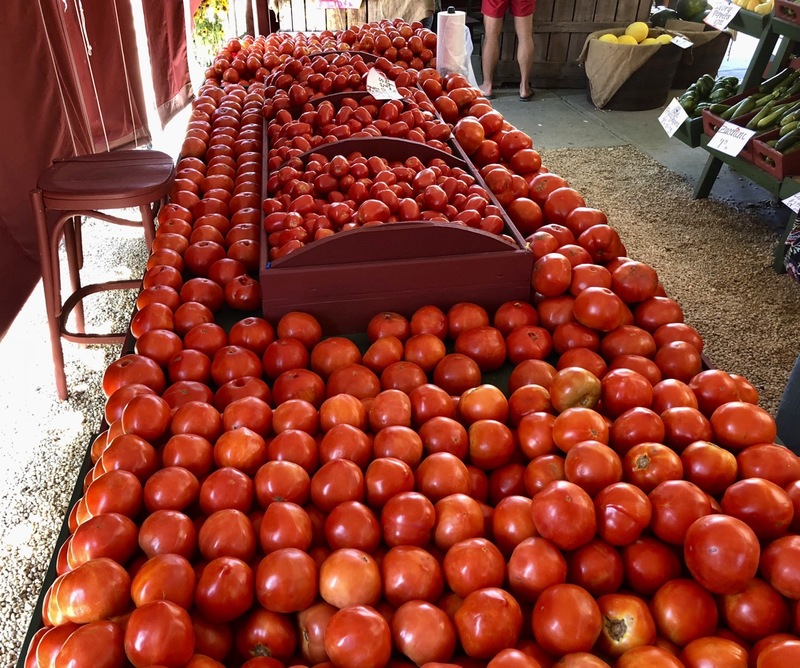 For those of us who are from north Jersey, we look forward to the Jersey tomatoes from this region to appear in local stores and farmers markets. 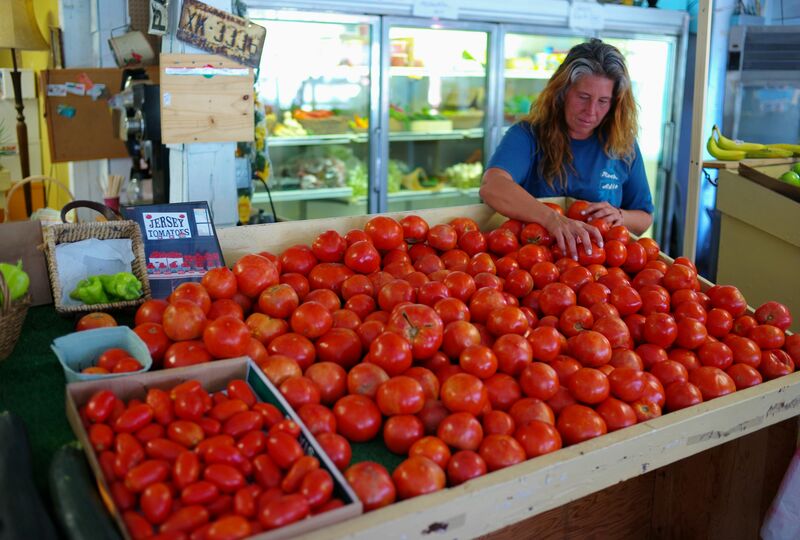 According to Delicious Orchards, they have been carrying south Jersey tomatoes since July. Laurie Price, from Laurie’s Market on Atkins Avenue in Neptune, said that she has plenty of excellent JT’s from south Jersey available now. There was some doubt that this year’s crop would be successful because of cold temperatures in May, 14 inch record rainfalls in June, and then the heat wave in July. But, by some miracle, the only effect of these harsh weather conditions is that the current north Jersey crop of JT’s will be about two weeks late, but they will start showing up next week, from Wall Twp. and Tinton Falls. Laurie is enthused about the JT’s this season, “The taste is awesome.” She says that people won’t buy a tomato that has blemishes on the skin, but she says that such marks are characteristic of Jersey’s. The ones with marks and gnarls get bought by Italian restaurants who use them to make sauce. Her selection is huge, and she brings fresh JT’s in daily. She currently is charging $2.95 a pound. The north Jersey crop will be available into October. 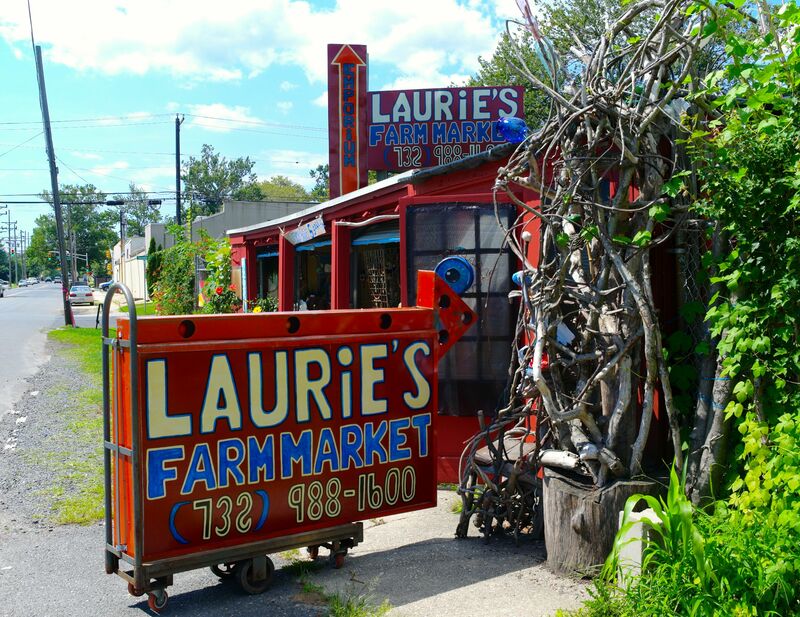 Laurie’s market is a local institution, in business since 1946. Laurie has been there since 2006. Her place is funky and fun to visit, and she and her staff are interesting, enthused and knowledgeable. Tara Ferguson sells her handcrafted sea glass jewelry. Tara’s aunt Diane is an artist who designs and makes women’s clothes . She has some art work for sale also. Yellow and orange watermelons. © Paul Goldfinger. 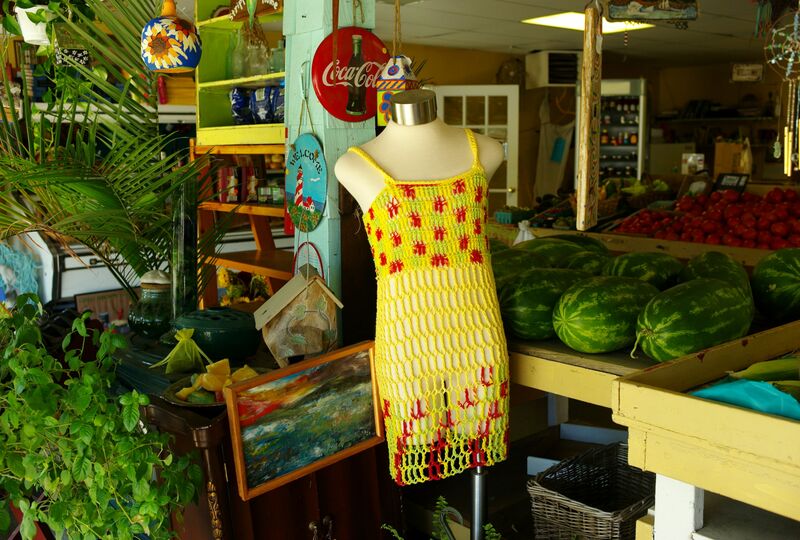 The selection at Laurie’s consists mostly of locally grown merchandise including Don’s famous corn from Wall picked daily, tomatoes from Tinton Falls, yellow, orange and red watermelons, white peaches, cantaloupes, and nectarines. She also offers homemade gazpacho and mozzarella (from Linden), tomato bisque, tomato salsa, jellies and jams. Billy, the local watermelon grower, uses a sugar tester to decide when to pick the fruit. She even has local spring water. Soon Laurie will be planting her winter garden which will produce cold weather crops such as lettuce, kale, collards, and brussel sprouts on the stalk. Laurie is open from 9 a.m. to 6:30 p.m. daily. From OG, if you take Corlies (Rt. 33) to Atkins Avenue (one block after Memorial Drive) and turn left, you will see her place on the right, about a mile up the road.